Beat first 5 ingredients in large bowl with mixer until blended. Mix flours, baking powder and soda. Gradually beat into peanut butter mixture until blended. Stir in remaining ingredients. Bake 9 to 11 min. or until golden brown. Cool on baking sheets 2 min. ; remove to wire racks. Cool completely. Substitute any combination of chopped dried fruit and nuts for the trail mix. 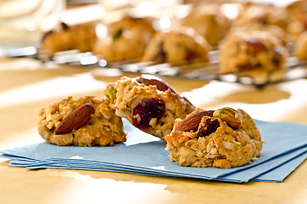 These delicious cookies, made with better-for-you ingredients, can be part of a healthy eating plan.